G’day Casino was launched back in 2013, and it holds a Curaçao gambling license. The website has an Australian theme design. Its spirit is kept alive with its logo depicting a kangaroo road signs and the silhouette of city of Sydney, with the famous Opera House. Even the croupiers have Australian themed costumes. nd easy to retrieve. All the games come in two playing versions: play for fun and play for real. The premium experience at G’day has had a redesign in 2015 that focused on the inclusion of fun graphic elements, together with the rethinking of the menu. Also, additional languages such as Spanish, Portuguese, Italian and German were included, as the casino aims to welcome players from all over the globe. 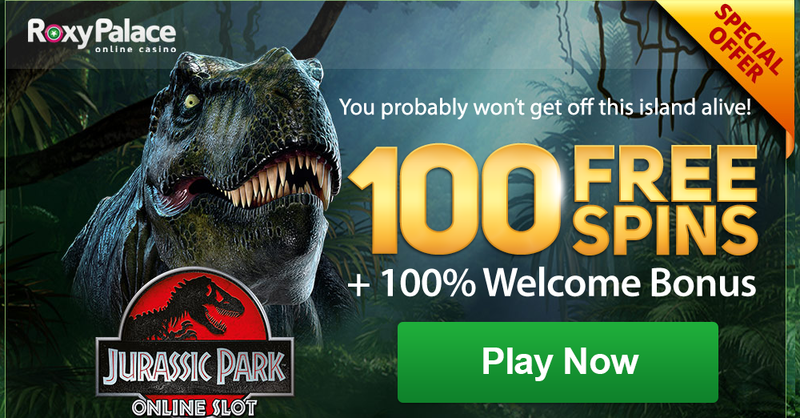 Unique offers, like 10% bonus for every day you deposit, and the social media campaign that offers $50 to ten lucky winners each Wednesday attract more and more new players. A multitude of software gaming providers fuel the G’day Casino experience: NetEnt, Leander Games, BetSoft, NYX Gaming, NextGen and Quickspin. A premium selection from all these providers make for a total of more than 350 titles. You can play more than 250 slots, 60 video poker versions, 60 table games, 8 jackpots and 3 live casino games. Play every famous name from Arabian Nights, Mega Fortune, Halls of Gods, Starburst, 1 Can 2 Can, Lost Island, Scarface, Attraction, Queen of Thrones, Dragon Drop, Aliens slot, Zombie Rush, Dead or Alive to A While on the Nile. There’s also different table games to be tried: pai gow, red dog, pontoon, American blackjack, European roulette, multi or single hand poker, 3D poker, joker wild, baccarat or lottery games. 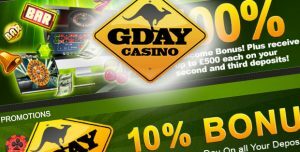 The bonus offer at G’day Casino is very generous and aimed at all types of players. The welcome bonus is spread between the first three deposits: 100% up to Infinity, as they say, the second bonus 25% up to $500, and the third 50% up to $500. The bonus is credited automatically into your account. The deposit and the bonus have to be wagered 35 times before withdrawal is permitted. If you register an account, you will receive 50 freespins at the Guns’n’Roses slot games, without making a deposit. Every time you make a new deposit, you will receive a 10% up to $50. There is a 35 times wagering requirement, but it applies only to the bonus. Every Wednesday comes with a $50 bonus from the Facebook page of the casino. You can win the bonus only by liking their page. The money prize has to be wagered 35 times. The weekly promotions include: Monday blues buster, Mystery bonus, Break the bank, Tremendous Thursday, Dish of the Day, Cash matches and Cash attack. With the smartphone and tablet versions for all operating systems, you can take G’day Casino with you wherever you go. Foxin Wins, Blood Suckers, Gonzos Quest and Starburst are some of the famous games available from the mobile platform. You can also create an account easily from the mobile device. Debit and credit cards, e-wallet payments, instant banking, bank transfer, fast bank transfer and prepaid cards are the methods with which you can deposit money into your G’day Casino account. Withdrawal is only made into the same account used for deposit. The minimum withdrawal is $50 and it takes between one and seven days, depending on the method. Customer support is offered in many languages, between 9:00 am to 00:00 am GTM, for seven days a week. Live chat and e-mail are the methods for getting in contact with the support service. Some of your questions might find an answer faster in the frequently asked questions section.